Cultural resource mitigation for the Bridger Trail segments impacted by the Express Pipeline in Fremont and Hot Springs Counties included large-scale photographic documentation of the segment, a published monograph documenting the history and route of the Bridger Trail, and an interpretive sign was placed along the east side of Wyoming State Highway 16/20 north of Lucerne, Wyoming. The Bridger Trail crossed the Bighorn River near this location in 1864. 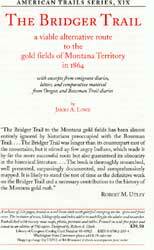 Passing over the Bridger Mountains to the southeast, the trail came down Kirby Creek, crossed the river and proceeded north to the Yellowstone River, then west to the gold fields in southwestern Montana. Within months following the 1863 gold discovery at Alder Gulch in present day Montana, a flood of miners and settlers were traveling to the mining communities of Bannack and Virginia City. Jim Bridger blazed a new trail in 1864. His trail through the Bighorn Basin west of the Big Horn Mountains avoided Sioux Indian hostility along the Bozeman Trail which lies to the east. It also eliminated the extra weeks of travel along the Oregon Trail-Fort Hall-Bannack road which lies to the west. Use of the Bridger Trail was short lived. However, many variants evolved from the trail in the 1880s and 1890s. The trail was the ancestor of a freighting network that connected remote ranches and early communities with Casper, Wyoming, and Billings, Montana. Jim Bridger was the most renowned mountain man, explorer and guide of the American West. His trail served as a safer route for emigration to Montana during a period of Native American resistance to Euro-American encroachment. Equally important, it acted as a foundation for the development of late nineteenth and early twentieth century transportation routes that made settlement possible in a region previously lacking any system of roads. This interpretive sign is part of historic site mitigation funded by Express Pipeline Inc.